ORDER NOW - With our 30 Day Money Back Guarantee, and Lifetime Replacement Guarantee on all our products, you can rest assured that if you're not happy, you'll get a full refund. There's no risk. To order, just click the add to cart button on this page. ﻿Every minute we see more & more MOMS embracing our Babywearing Philosophy and that’s the best gift we could ask for! Less Fussing and Crying - A recent study showed that carrying your baby at least three hours a day reduces crying and fussing 43% during the day, and 51% at night (Pediatrics Magazine). Babies are happier, they have less need to cry, and parents enjoy their babies more as a result. Enhanced Bonding - More constant feeding, touching, eye contact and cuddling releases greater levels of the “Love Hormone” Oxytocin. Elevated levels of Oxytocin mean you literally fall in love with your baby to a greater degree than you otherwise would. The more you wear the more you love. Enhanced Learning - Carried babies have enhanced visual and auditory alertness. Carrying a baby promotes cognitive development and speech development since babies are exposed to more experiences and conversations. Get 30% OFF at Checkout Today Only!!! Thank you for being a part of our ever-growing community, and being with us through this amazing year! THANK YOU! These are THE BEST carriers! I've been waiting to use these with my baby since i got pregnant. After two months of using the GREY BABY WRAP, my baby is happier than ever, he falls asleep instantly. I use it frequently need nothing else. I have never bought or used a WRAP before. I’ve always used the clip and strap method. I LOVE CUDDLEBUG'S WRAP. It’s soft, with enough stretch. I’ve put the wrap on my children and husband–they all agree it’s very comfy. I bought this before I delivered so my poor shi-tzhu puppy is our Guinea Pig–even he enjoys being wrapped up in it. Can’t wait to use it on our baby! CuddleBug is amazing! Just got my order and I couldn't be happier! I've spent a lot of $$ on baby products over the years that have been a complete waste of money, but CuddleBug is worth every penny. I bought this baby wrap for my wife, and we both absolutely LOVE IT!!!! I would buy it again in a heartbeat! 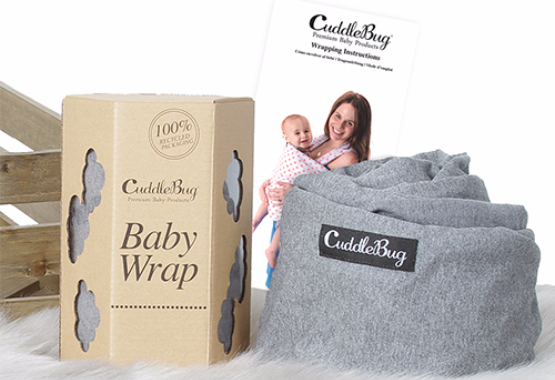 CuddleBug understands the need for safe, adorable, ultra-high quality baby wraps and carriers, which are still easily affordable on a family budget. Extreme value for money is our mantra, and CuddleBug is so sure of its quality, it offers a Lifetime Guarantee on all products. At a 20-50% price discount to other leading brands, it’s no wonder CuddleBug is one of the fastest growing baby companies in the world.